The nation's No. 1 high school guard, Southern Methodist University signee Emmanuel Mudiay of Dallas, will hire an agent and take a job playing basketball overseas next season. Hours after Yahoo Sports reported that Mudiay was considering the move, SMU coach Larry Brown issued a statement that his top recruit planned to bypass college and turn professional. "This is not an academic issue, since he has been admitted to SMU, but rather a hardship issue," Brown said in a statement. Nevertheless, little evidence supports the Hall of Fame coach's assertion on Mudiay's reason for leaving SMU. Mudiay had conversations with Brown and university officials about his ability to become academically eligible and withstand NCAA scrutiny into his amateur status to play his freshman year, sources told Yahoo Sports. Mudiay's brother, Stephane, has been discussing potential representation for Emmanuel with player agents for the past week, sources told Yahoo Sports. 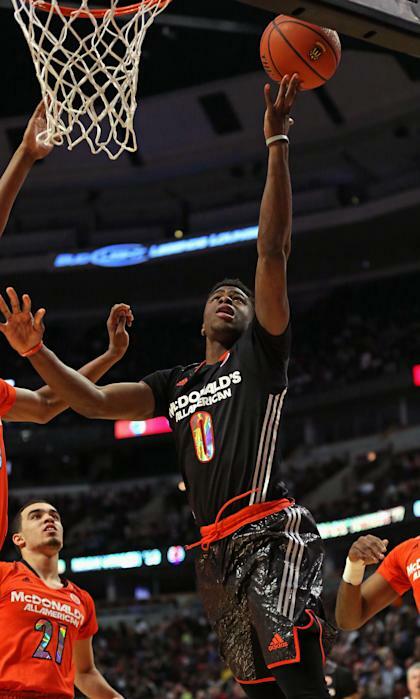 Mudiay, an explosive 6-foot-5 guard, has been projected as a lottery pick in the 2015 NBA draft. The Chinese Basketball Association has been discussed as a possible destination for Mudiay, a native of the Congo. Mudiay attended Prime Prep Academy in Dallas. He was born in Zaire and escaped war-torn Congo before settling in the United States with his family.